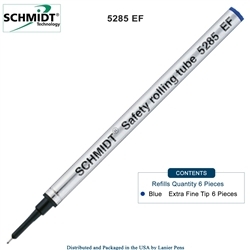 Schmidt 5285 Extra Fine Roller Ball Refill 5888 StyleMetal Body Roller Ball Refill. Safety rolling tube refill with metal tube and stainless steel needlepoint tip with Tungsten Carbide 0.5mm ball. Standard size metal body roller ball refill by Schmidt. Needlepoint tip with Tungsten Carbide ball. Our current Schmidt 5285 refill offerings include the following pen refills:. Lanier Pens is your source for all Schmidt Pen refills including the popular Schmidt 5285Extra Fine Rollerball Metal Refill.